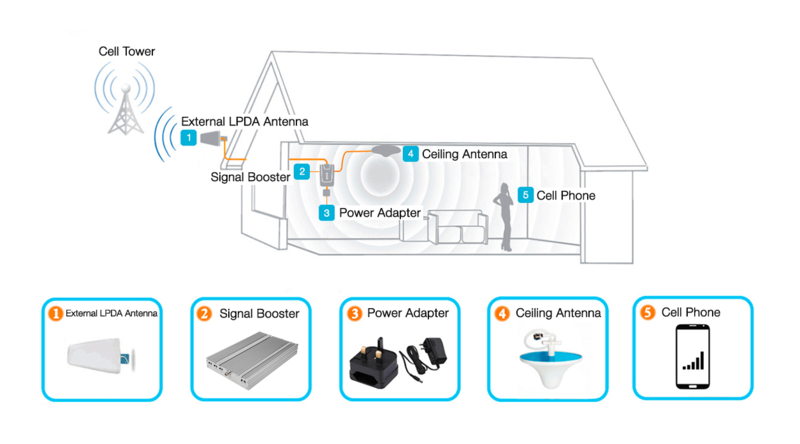 Do you need to boost the voice and 3G data signal over a large area? If so, the ‘Ultra 4’ is the product for you! Sporting a range suitable for a sizable house or restaurant, this model operates at 850 / 2100 MHz and will boost mobile reception and 3G signal for Spark and 3G data signal for Vodafone and 2Degrees for up to 1000 sq m.
If you are a 3G user with weak signal woes at your property, you will need to boost both the 850 MHz and 2100 MHz bandwidths with Spark, Vodafone or 2Degrees to get a good signal. But don’t worry, we have you covered! The ‘Ultra 4’ model is an affordable dual-band cell phone booster which will give you increased signal for up to 1500 square meteres. This futuristic model looks great and is perfect for use in New Zealand. You can expect the full 5-bar experience for both bandwidths and can rest assured that this technology is safe for your family. We like to keep things simple, so we send you the kit with everything you need. Set up takes around 15 minutes, and if you do experience any issues, we are on hand 24/7 to help you get things up and running. 2110-2170 MHz AC90-264V,output DC 5V / 3A 200*120*38 mm. 1.8 KG. Dimensions (L x W x H ) 200*120*38 mm. The unit improved our signal greatly. Our Spark mobile service is much stronger now.